We are definitely in a civil war just not in the shooting phase. 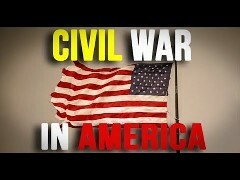 The Left Thinks They Can Win a Civil War. California is the Key? All civil wars start with no shooting. Then it escalates. United States has foolishly given Pakistan more than 33 billion dollars in aid over the last 15 years, and they have given us nothing but lies & deceit, thinking of our leaders as fools. They give safe haven to the terrorists we hunt in Afghanistan, with little help. No more! “We are no longer going to give money to people who are against the U.S. or say ‘deathto America,’ or do anything that would be ti-U.S.,” Haley explained to Fox’s Bret Baier. A few astute national-security experts have been warning for years that the situation along the nearly 4,000-mile swath of largely unpatrolled U.S.-Canadian border will end up being every bit as dangerous as the southern border with Mexico. This could be handled simply and effectively. ICE needs to stop issuing detainer requests and start obtaining warrants if they believe there is probable cause. Big Meat! Changing America, one meatpacking town at a time! having your rights stripped by your own representatives right in front of you, and for many of you, you cheer it on! the UK is at war, even as it remains determined to appease and accommodate Muslim groups and pretend that no war is happening. Last year, 8,432 people were killed in 370 Muslim terror attacks. An overwhelming majority were in Muslim countries such as Syria, Egypt, and Afghanistan. In Europe, Muslim first- and second-generation immigrants have killed approximately 311 people since 2015. Muslim gangs and criminals are mainly responsible for rising rates of violence in Germany, Sweden, the United Kingdom, and France. Remember that when Michele Bachmann called for an investigation into Muslim Brotherhood infiltration in the U.S. government, McCain denounced her on the Senate floor as a bigot and an Islamophobe.